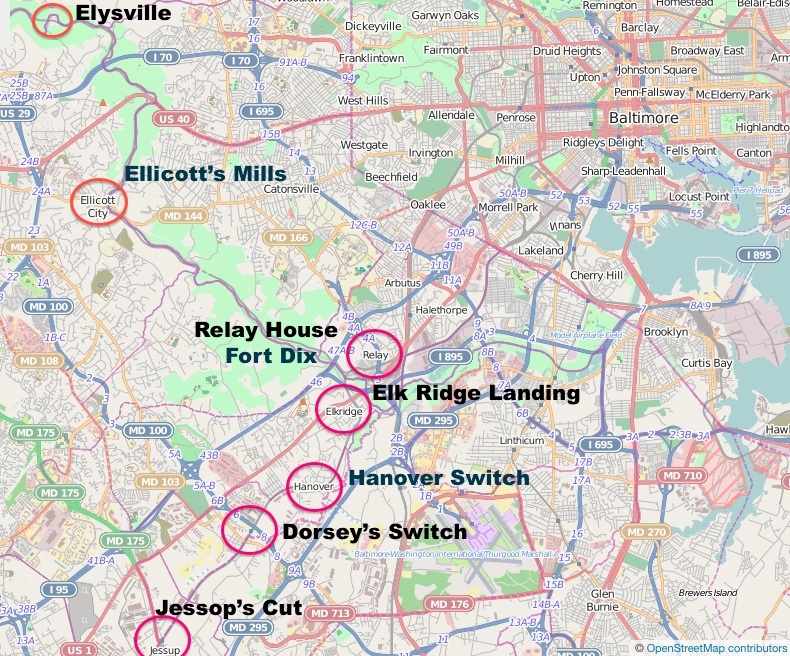 Quite a few units rotated through duty at Baltimore – and specifically at Relay – during the war. The one that I want to focus on today is the 138th PA, which took up the post on August 30, 1862 and remained until June 16, 1863. I mentioned before that Peter Thorn – the caretaker of Evergreen Cemetery in Gettysburg – left his family in August of 1862 to join the army. The unit that he joined went to Harrisburg and became Co. B of the 138th PA. Peter was selected to be a Corporal in the company. Another group of men formed in Adams County became Co. G in the 138th PA. After just a few days in Pennsylvania’s capital, the regiment shipped out to become part of the defenses of Baltimore, and was immediately assigned to duty at Relay House. Deployment of the 138th PA. Base map from OpenStreetMap. Annotations by the author. You can see that the emphasis was on defending the Washington Branch – that’s where most of the troops were deployed. Now, this isn’t to say that these assignments held through their entire duty in the area. Guard duty like this was a dreary task, and the units were routinely rotated back to the regiment’s headquarters at Relay House where there was a larger encampment that gave the men a chance to drill and practice their military skills. Relay House was also centrally-located in case reinforcements needed to be shifted along the railroad in a crisis. As I alluded-to before though, not much happened along this section of the B&O after May of 1861. So what were these men spending their time doing? According to the orders of another unit that served at Relay, the 60th NY, the men were supposed to watch all the bridges, culverts, and switches along their sector. They were supposed to periodically patrol the track, looking for sections that had been removed or otherwise damaged, and for obstructions (natural or otherwise) that needed to be cleared. These tasks became even more important at night, when the cover of darkness meant that mischief was easier to pull off. This was not exactly a glamorous posting. In fact, the task was so boring that Col. Sumwalt himself fell into a less-than-honorable lifestyle and was kicked out of the army for “conduct unbecoming an officer and a gentleman” during the unit’s time at Relay. At least for a little while though, Peter Thorn and the other men from Gettysburg were stationed practically right outside my front door, protecting the railroad that ran past Ellicott’s Mills. I spend so much time studying Gettysburg, and taking trips up there, that it’s funny to think that men from that little anonymous town spent more than 9 months of their Civil War service within a few miles of my house. You never know what history might be lurking in your own front yard until you go looking for it. …any force of Maryland secessionists that could not have been overcome with a large yellow dog. That said, he wanted to take control of Baltimore and make sure that the secessionists couldn’t gain a foothold there. Without asking for permission from his superiors, he made a plan. On May 13, 1861, under cover of darkness and in the midst of a heavy rainstorm, Butler loaded about 1,000 of his men onto a train at Relay and steamed into Baltimore. By midnight, they had possession of Federal Hill, and had begun building fortifications to hold the hill. It was a bloodless invasion as the rainy night had kept most of Baltimore’s citizens indoors and unaware of what was happening. Butler notified the commander of Fort McHenry that the city was secure, but that guns should be trained on the downtown area, in case there was an attempt to take Federal Hill by force. None came. Even though they were happy to have Baltimore neutralized, the higher-ups in the army didn’t like the blatant show of force. They immediately relieved Brig. General Butler of his command in Baltimore. New troops under Maj. General John A. Dix would be moved into town, taking possession of the forts around Baltimore and patrolling the railroads. 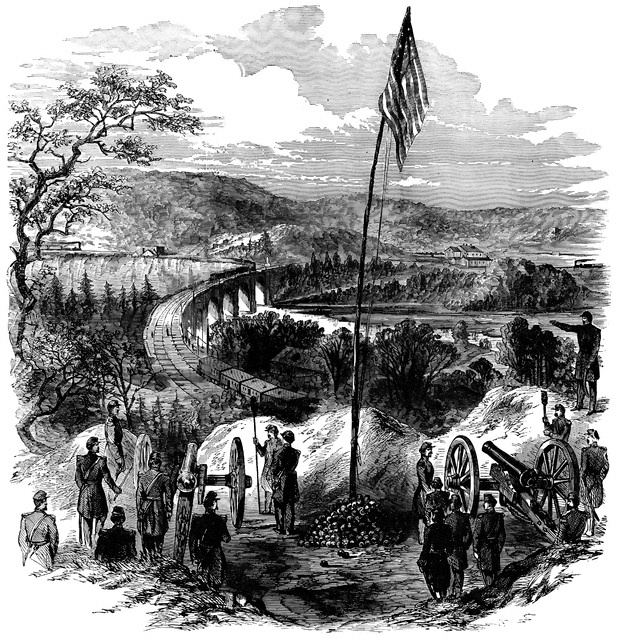 A new fort was constructed at Relay – on the hill directly to the north of the Thomas Viaduct – called Fort Dix, after the new commander. Camp Relay was established nearby, and Camp Essex sprang up on the Howard County side of the river in Elkridge. By the end of the war, there were 28 cannons in place to protect the Relay junction and the Thomas Viaduct. Thousands of troops served in the area, being constantly rotated in and out over the course of the war. One of the units that spent a few months here was the 138th PA, and that will bring us back to Peter Thorn. After gaining control of the junction and bridge at Relay, Brig. General Butler got word that a new experimental weapon was being moved out of Baltimore – probably by horses along the old National Road (today known as Frederick Road, MD 144) – toward Harper’s Ferry with the plan of selling it to the Confederacy. This weapon was the Winans Steam Gun. 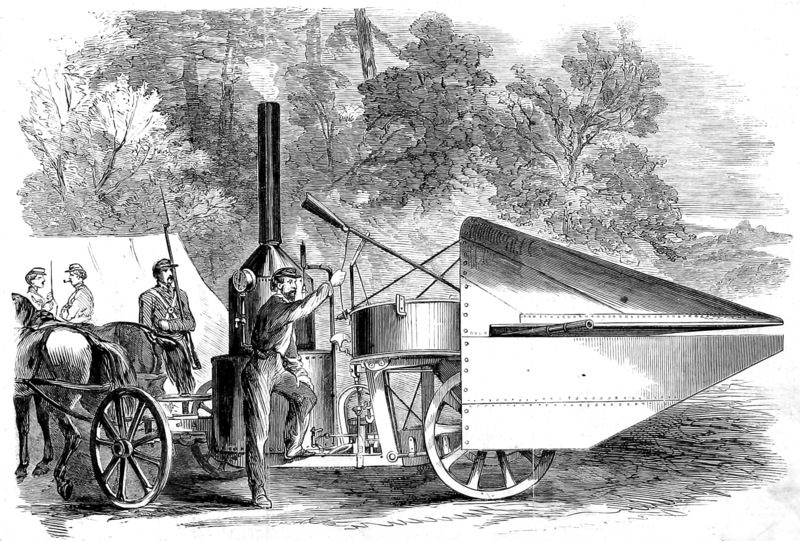 The Winans Steam Gun in the hands of Union troops. Engraving from Wikipedia. Against a brick wall about a foot thick, heavy timbers, each a foot thick, were piled up. When finally placed ready for the test, there was about three feet of wood and one foot of brick ready to receive the discharge of the gun. The gun was some 30 or 40 feet away from the target. At a given signal an awful uproar was begun. In less than a minute the gun had been stopped. In that short time the heavy timbers had either been smashed or thrown into the air. Every one of us was convinced that the discharge would have mowed down a whole regiment. Clearly, it would be a bad thing if this technology fell into enemy hands. On May 11, 1861, Butler halted the noon train from Baltimore to Ellicott’s Mills (present day Ellicott City) to commandeer it. As many as 500 men from the 6th MA, as well as 2 of Cook’s guns were quickly loaded on the train in the hopes of intercepting the experimental weapon. The gun was in fact traveling along the Frederick Road in a mule-drawn wagon. Its smugglers were trying to disguise it as a piece of farming equipment in an attempt to avoid suspicion. Butler’s efforts paid off. The Union troop train arrived just in time to stop the contraband in its tracks somewhere between Illchester and Ellicott’s Mills and the smugglers (including the gun’s probable inventor, Charles S. Dickinson) hardly put up a struggle. Four of them were immediately arrested. The weapon and prisoners were brought back to Relay. The Union forces at Relay were very interested in testing-out their new capture, but found the results to be much less than what they expected. Aside from the issues they saw of how to keep the weapon properly fueled and loaded with ammunition in the midst of a battle situation, the performance of the gun was just pitiful. Rounds seemed to dribble out of the barrel haphazardly. It was hard to imagine this as a purported super weapon. What these men did not know was that there was a second wagon traveling with the gun, and several of the important parts of the gun had been removed and placed in the other wagon prior to departing Baltimore. When the gun itself was captured, the second wagon escaped. The steam gun was useless to the Union forces, but in that, it also left the impression that the technology itself was flawed and further attempts to develop the weapon went nowhere. Of course no one knew it at the time, but this was the most excitement that the area would see during the war. The B&O was too important not to be defended, and troops would rotate through this post until the end of the war, but the feared attacks never came. In the next post, we’ll finally bring it back to Peter Thorn. In the last post, we looked at the Baltimore Riot that took place early in the war. 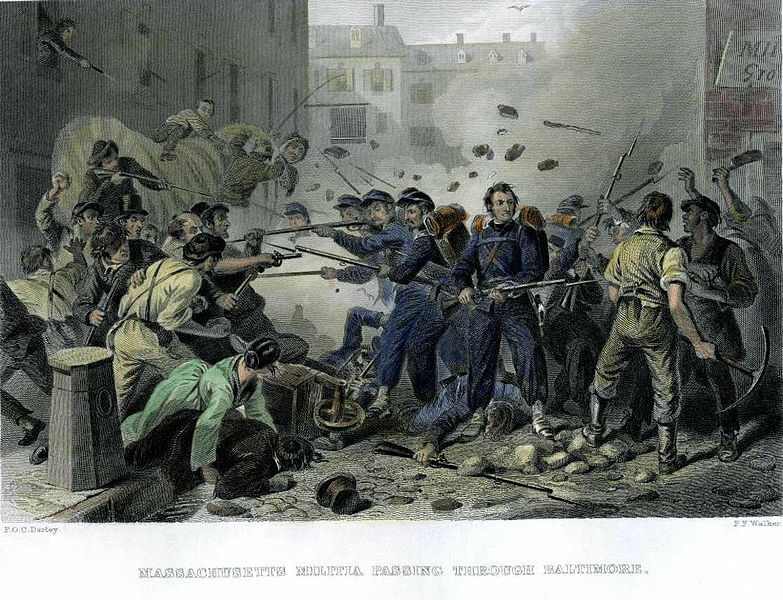 To Union forces in 1861, Baltimore was hostile territory. Not wanting a repeat of the experience that the 6th MA had, the next group of troops coming in from the north stopped at Perryville, MD and boarded boats. They were heading to Annapolis – using the Chesapeake Bay to route around the potentially-troublesome city of Baltimore. These men were from the 8th MA, under the command of Brig. General Benjamin Butler. His orders were to open up the route into Washington, D.C. from the north so that troops and supplies could continue to flow. Butler landed his men at the Naval Academy on April 21, 1861, and began the work of repairing the sabotaged railroads – first, the line leading from Annapolis to the Washington branch of the B&O at Annapolis Junction, and then the Washington branch itself. Once those lines were secured, Butler turned his attention to the north, taking possession of Relay – a very small town in the Patapsco river valley – on May 5, 1861 with the 6th MA, the 8th NY Militia, and Major Cook’s battery of Boston Light Artillery. Relay was especially important because it is the northernmost point on the Washington branch of the B&O. It’s where the line began, and where it met with the main line from Baltimore to points west in the Ohio valley. And – most importantly – at the time of the Civil War, this was the ONLY railroad going into Washington, D.C. The Thomas Viaduct. Engraving from Wikipedia. 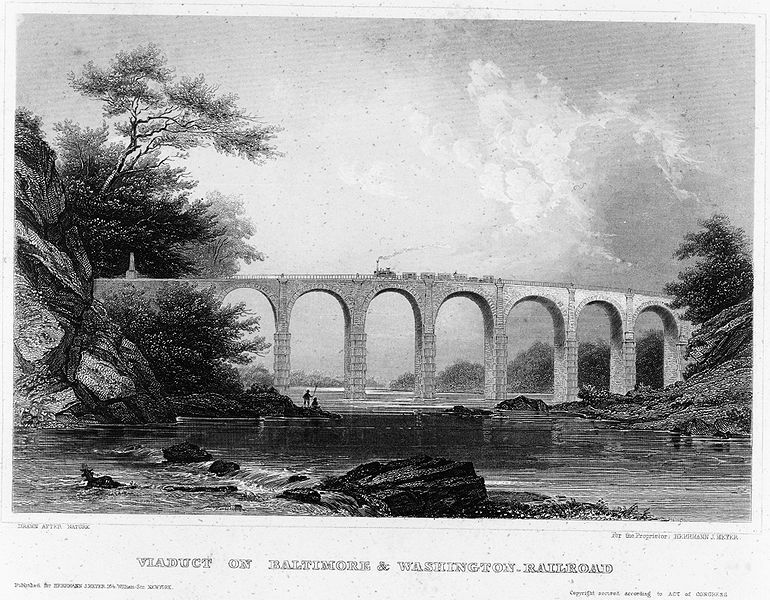 In order for the Washington branch to be built in the first place, a bridge had to be constructed to cross the Patapsco river. That bridge is the Thomas Viaduct – named for the first President of the B&O railroad – and it remains the longest stone-arch bridge on a curve in the world, still carrying trains on their way to the capital to this day. This bridge and the junction next to it were of extreme strategic importance to the Union cause. The army HAD to control this place, and being just 7 miles from Baltimore, it was facing real threats. The Bouquet Battery: Two of Cook’s guns overlooking the Thomas Viaduct from the Howard County side. Butler placed his guns and deployed his 2,000 troops along the tracks in the area to ensure that no more sabotage could take place. All trains out of Baltimore were stopped and inspected to see if they were carrying men or materiel destined for the Confederacy, but this policy didn’t last long. At the request of the owners of the B&O, Butler agreed to back down somewhat and only perform random searches. There will be one more exciting incident along the B&O, though. A tip about a secret Confederate weapon will cause some of Butler’s men to leave Relay to find and capture some potentially-threatening cargo. In my last post, I talked about the story of Elizabeth Thorn, and her husband Peter. I’m going to return to that storyline, but I wanted to take a short detour (which may be interesting to readers on its own, really) so that we can get a sense of context. I spend a lot of time going to Civil War battlefields. That much should be pretty clear from this website. Most of the time, the destination is Gettysburg, but I’ve spent time at Antietam, Manassas, Fredericksburg, Chancellorsville, The Wilderness, and Spotsylvania, too. What can be easy to forget is that there is history all around us – not just at historical parks and tourist attractions. Recently, I was inspired to dive into some very local history, and I’ve found some pretty cool stuff. In fact, this may become a new rabbit hole for this blog to go down as I find out more and more. So, let me set the scene a little. As you may know, Maryland is a border state. It is situated north of Washington, D.C. – a city that was carved out of Maryland, in fact – and up until the end of the Civil War, was a slave-holding state. When Abraham Lincoln was elected in 1860, it was well-known that the Republican party had an abolitionist wing, and there was concern that slavery’s days were numbered. This is what prompted several of the southern states to secede from the Union. It was imperative that the capital not be surrounded by enemy territory – especially to the north – so it became vital to keep Maryland in the Union by any means necessary. This was made crystal clear on April 19, 1861 (a week after Confederate forces had fired on Fort Sumter) when the 6th Massachusetts Infantry came through Baltimore on its way to Washington. Back in those days, there was no Amtrak or CSX. Individual companies owned separate rail lines between cities. Troops from the 6th MA came into Baltimore on the Philadelphia, Wilmington, and Baltimore railroad, and then had to travel across town about a mile to reach the station for the Baltimore and Ohio (B&O) railroad to take them into Washington, D.C. It was this transfer between rail lines that caused issues. In those days, there was a lot of southern sentiment in Baltimore. Thousands of Baltimoreans formed a mob outside of Camden Station to harass the Union troops as they arrived. Some dug cobblestones out of the street to throw at the soldiers. Others put up make-shift blockages in the road and obstructed traffic by their very presence. The men of the 6th MA were forced to abandon the carriages they were in and proceed on foot to the station. Then a gunshot rang out from the crowd. The Baltimore Riot. Engraving from Wikipedia. Surrounded by hostile citizens and fearing for their lives, the troops returned fire into the crowd. When it was all said and done, 13 citizens of Baltimore were killed, and many more suffered wounds. The soldiers were able to board and leave on their train, but at least 1 of them was killed, and some of the men were wounded. While certainly not a battle, it was the first blood shed of the war. The train made its way to Relay, MD, a small stopping-off point on the B&O railroad for travelers on their way to points west. It was about to become a highly-fortified, major strategic location for the Union army. All because of the experience that the 6th MA just had, and the need to defend a famous construction project that was completed nearly 30 years earlier. One of the human interest stories around the Battle of Gettysburg that has come to the forefront in the last few years is the story of Elizabeth Thorn. Her husband, Peter Thorn, was the caretaker of the Evergreen Cemetery on Gettysburg’s famed Cemetery Hill from 1856-1874. The Thorns and their children lived in the gatehouse of the cemetery during this period. Of course, the battle took place right in the middle of their tenure, in July of 1863. Peter wasn’t home during the summer of ’63, though. In August of 1862, he joined the war effort himself – enlisting with a local infantry company. Elizabeth was left to tend to the children and the cemetery by herself. When the armies started closing-in on the town, she fled the battle zone with the kids. Despite his being away at war, Elizabeth must have had some contact with her husband during his service. She was 6-months pregnant when she was forced to leave her home. 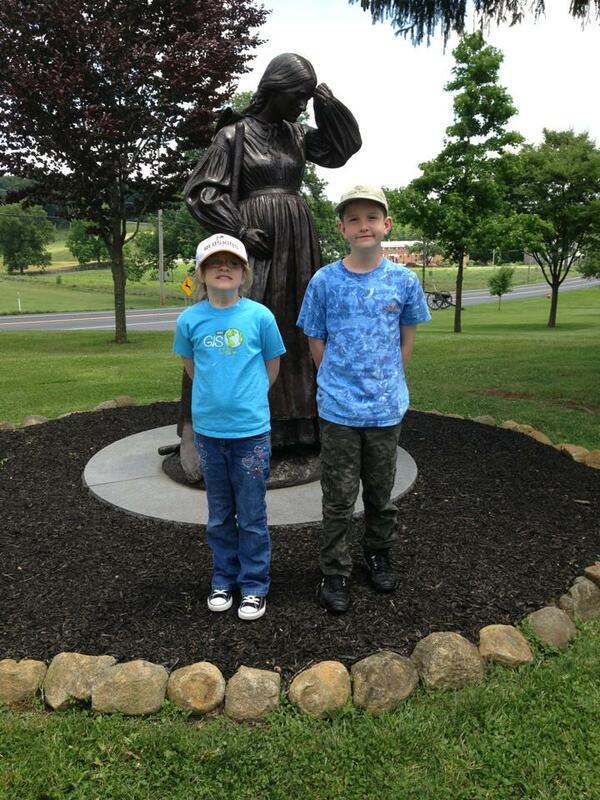 My niece, Abby and nephew, Nathan in front of the statue of Elizabeth Thorn. Photo by Karen Michener. After the danger passed, she made her way back to the cemetery gatehouse only to find that it had been looted and damaged in the fray. The cemetery itself was right in the middle of the battlefield, and there were bodies strewn everywhere. The cemetery was her responsibility as well as being her home, and she got right to work – personally burying somewhere between 91 and 106 bodies herself in the mid-July heat. The daughter she was carrying at the time died young, only barely reaching her teenage years. Elizabeth blamed the stress of her post-battle experience for the poor health and eventual death of the child. On a happier note, her efforts have recently been recognized more properly. There is now a statue of Elizabeth, placed in 2002, known as the Gettysburg Women’s Memorial just inside the gates of Evergreen Cemetery. But that’s not all there is to the story. I wanted to tell Elizabeth’s story so that I could set up the telling of part of Peter’s. The wartime service that took him from his home, brought him closer to mine – much closer. But we’ll explore that further in a future post. My brother Phil – a USMC Captain – took a trip up to Gettysburg with me last Friday. Phil’s interest in going was to see the field and analyze what happened there from the perspective of his modern Marine Corps infantry training. Of course, I thought it would be cool to see how a modern soldier goes through that process. It would be a learning experience for both of us. It was a really great day (if not a little on the cold side). I took him through almost the whole tour. While we hit Culp’s Hill, we didn’t get to the East Cavalry or South Cavalry fields, and we tended to ignore the Confederate perspective, focusing instead on the Union defensive positions to get our views of the field. The biggest surprise of the day was his reaction to Maj. General Daniel Sickles‘ part in the battle. In the interest of full disclosure, I’m a fan of Sickles (as you could maybe tell). My thoughts prior to last week were more-or-less middle-of-the-road on his actions during the battle. I can see both sides of the argument, but I tend to lean in the pro-Sickles direction if I’m pressed. Obviously, I’m OK with the over-all outcome of the battle, and I find counterfactuals to be…difficult (to say the least). Even if they are fun, they’re a sloppy way to do historical analysis. All that said, I did my best to be even-handed. On the drive up, I reminded Phil about Sickles’ murderous history, and his path to the army by way of political considerations rather than military acumen. As the highest-ranking non-West Pointer in the Army of the Potomac, he was the very definition of “black sheep”. My character assassination prep work was all undone as soon as Phil set foot in the Peach Orchard. Instantly, he said that this is where he’d want to be. It was the same when we got out on Houck’s Ridge. He became more adamant as I explained how Sickles came to his decision to move. Let’s go through it. The III Corps had arrived at Gettysburg the night of July 1, 1863 by way of the Emmitsburg Road. They would have passed right over the Peach Orchard on their way to the field. Coming down off of that terrain to take the position they did to the left of the II Corps must have felt strange. By the morning of July 2, Sickles was asking headquarters to clarify his orders as to the III Corps positioning. Was Sickles playing a game here? The orders were to extend the II Corps line to the south, and occupy the position held by Brig. General Geary‘s division the night before. Does anyone know what position Geary’s division held? Sickles sure didn’t – Geary vacated the position and moved to Culp’s Hill at about 6am, and Sickles slept in until around 9am. So where was Geary? Where was Sickles supposed to end his line? Little Round Top. While LRT is a nice piece of real estate, take a look at the rest of this proposed position. Have you ever ridden the line from LRT up to just before the Pennsylvania Monument with a critical eye? This was Sickles’ assigned position. It’s kind of a drive-through wasteland until you get up to United States Ave. There’s hardly any regiment markers along there, and NO cannons on display. Ever wonder why? Next time you’re in Gettysburg, drive up to the VI Corps headquarters marker. Pull over to the right side of the road and park. Now look around. Where are you going to place a line in here? The open ground to the left (west) is rocky, marshy, and low-lying – generally unfit for troop deployments. It’s also got a great view of…those woods in front of you. You won’t see the enemy approaching. Placing your line on the small, tree-covered hill to the right (east) will affect your visibility even more, and that hill isn’t big enough to cover the whole sector effectively anyway. And there’s NO WAY to use artillery anywhere around here because of all the woods. North of United States Ave. it isn’t much better. At least you can place artillery here (and the NPS has pieces out to help your imagination), but as you look west, you can see how the ridge that the Emmitsburg Road is on (including the part that contains a certain Peach Orchard) absolutely OWNS (as Phil would say) this line. With enemy artillery placed there, and a concerted infantry effort to go along with it, any troops in this position could be dislodged. It’s NOT a very good place to be. I think this is why Sickles was confused the morning of July 2. “This is my position? THIS? Are you for real right now?” It was such a bad placement that it couldn’t possibly be what was intended. He HAD to be confused. Sickles would much rather be up on that Peach Orchard and along the Emmitsburg Road. It’s much higher, open ground. He’d have no problem employing his artillery effectively. It’s obvious to anyone who really looks at it that this is the better position, right? By late morning, Sickles is up at headquarters lobbying for someone to come help him deploy his corps. General Meade was too busy to have a look. Besides, if the Confederates attacked, it would probably be from the north – where they were known to be located. General Warren, the Chief Topographical Engineer, couldn’t be spared to examine the position either. Since the main concern expressed by Sickles was related to placing his guns, General Hunt, the Chief of Artillery, was allowed to go to the left flank and advise General Sickles. Hunt agreed that Sickles’ position was horrible for artillery. There were no good options. Sickles asks Hunt to ride out to the Peach Orchard – his preferred position – to have a look. Immediately Hunt realized – like my brother 150 years later – that this ground was commanding. Artillery placement would be easy and effective out here. Sensing Sickles’ enthusiasm, Hunt was quick to remind the III Corps commander that, while he agreed with the assessment of the terrain, he could not authorize a troop movement. Of course, he did give a final piece of advice: If he were to make such a move, he’d want to know what’s going on in the woods over on Seminary Ridge first. Sickles agreed and sent Hiram Berdan‘s Sharpshooters on a recon mission. Of course, Berdan finds Confederates – the right flank of Wilcox‘s brigade. This is enough evidence for Sickles to believe that an attacking force was massing on his front. He decided to make his move, and the rest is history. The move was not without problems, though. Sickles’ small III Corps didn’t really have enough men to cover his intended line effectively. He was now trying to cover nearly twice the frontage that he had been originally assigned – from the Codori Farm down to Devil’s Den. He tried to compensate for this by using artillery to hold the gap between the Peach Orchard and Rose’s Woods. Sickles feels like he doesn’t have much of a choice though. He can’t force other units to come to his aid, and headquarters doesn’t seem too concerned with what may be happening on the left flank. By the time General Meade starts paying attention, it’s too late. The Confederate attack has already begun, and Meade feels like his only choice is to commit resources from the V and II Corps to try and shore-up the position. Of course, we know that this was not enough, and the failure of that line to hold is attributed by some people to Sickles’ incompetence. After all, he didn’t have enough men to cover the line. Obviously, the fact that he doesn’t have the proper resources doesn’t mean that the position is a bad one. Could he have done a better job communicating the issues he was seeing to headquarters, and more forcefully requesting reinforcements? Sure. Could Meade have not ignored the concerns of his political general, and taken a closer look at the positioning of his entire army? Absolutely. The two military virtues that Phil really saw Sickles living out were making decentralized command decisions, and being offensive-minded. While many people will fault Sickles for disobeying orders (or at least being loose with their interpretation), my brother argues that it’s a positive thing. Sickles knew things that Meade didn’t, and rather than wait for permission, he took initiative and did what he could to counter the threat. In taking his action, even in a defensive posture, Sickles was thinking aggressively. He was looking for a better position for his troops. He was actively seeking out threats to his front, and looking to deprive the enemy of the elements of surprise and superior terrain. Yes – the III Corps took about 40% casualties on July 2, but with his line placed in the horrible position it was “supposed to be in”, do we really know that things would have turned out any better? Sickles’ move definitely caused the Confederates to change their attack plan, and delayed their advance significantly. Like I said before, it’s very hard to do counterfactuals. You can never really know the answers to all the “what ifs”, but I think that my brother is right. Being on that ground you can tell that the Emmitsburg Road / Peach Orchard / Devil’s Den line is a much better piece of terrain than the marshy mess that the III Corps began the day with. And who knows – if Meade had been involved in making the move, and provided an adequate number of troops in the first place (instead of as last-minute reinforcements thrown in almost haphazardly), could that line have held against the single wave of Confederate attacks that came against it? I think it stood a pretty good chance. We’ll never really know, and that’s part of the fun.